At Nova Communications, we want to be able to provide you, our customers, with the tools they need to run their day-to-day work efficiently and safely. In our 35 years of business, we have built a reputation for providing communication through technology sources that have kept your teams safe, efficient and productive. We celebrate a lot of successes, whether it’s our smart communities, SCADA networks or Motorola digital two way radio systems – all backed by our professional engineering and technical services staff. A lot of that reputation also stems from the companies we have the pleasure of partnering with. This series, The Partners We Keep, will highlight the partnerships we have garnered to build the business you can trust when it comes to communication. This week, we are going to touch on our partnership with Motorola Solutions. Motorola Solutions two way radios and accessories have a history that Nova Communications can really get behind. Having been in the business since two way radios were invented in 1943, Motorola Solutions has seen the changes in critical communications infrastructure over the years. And with technology changing day-to-day with two way radios, Nova Communications has had had to work to understand those changes, too. Together, Motorola Solutions and Nova have worked together and supported each other for more than 25 years. Through its industry-leading research, Motorola Solutions has developed an understanding of the need for the best communication tools in the industries they serve – from manufacturing, hospitality, health care, retail, oil and gas to emergency services. It’s through this testing Motorola Solutions does with customers in those industries that enables the company to develop durable, rugged and enhanced features which will fit needs across the board. In addition to that, Motorola Solutions has a series of research and development testing that take their brand to the next level. This includes going into the field with the product users, including harsh environmental conditions, to understand fully the wants and needs of individual industries. The conversations that occur during this research lead to further development of the best product for you at the end of the day. Testing is another avenue to ensure Motorola Solutions is providing customers with the most durable product available, in real-world situations. These include drop testing both the radio and its battery 42 times on concrete to ensure it can withstand impacts. Shock tests and vibration tests are also part of the mix, because a two way radio that cannot withstand those impacts are not going to function in a number of work environments. As a company, Motorola Solutions has been a key player in public safety and commercial communication with both its P25 radio systems, along with the development of the MotoTRBO line of two way radios for businesses like yours. With the latest line of two way radios, users have the added benefit of better coverage, range, longer battery life and noise canceling features that were developed as a result of conversations with people in the field. With a motto of “We help people be their best in the moments that matter”, you know this is quality leadership. Finally, Motorola Solutions has a strong commitment to the communities they serve, and have invested heavily in the future of STEM industries (Science, Technology, Engineering and Math), so up and coming generations have opportunities to understand a growing industry. So the real question here becomes – why not Motorola Solutions? Where Does Nova Fit In? As a Motorola Solutions Platinum Channel Partner, Nova Communications is proud of the relationship we have developed with Motorola. We see the value in the product that Motorola Solutions produces, and the benefit to you, no matter what your industry. Our job is to help you understand that need as well, and the added productivity and safety benefits that come from using a Motorola two way radio product. Nova’s relationship with Motorola Solutions spans more than 20 years – and it’s not going anywhere anytime soon. Our partnership with Motorola Solutions enables us to bring a vast knowledge base to the table when you speak with one of our two way radio experts. The team here at Nova Communications goes through factory training, ongoing customer requirements training, marketing and information sources and creative system deployment to ensure that, when they get a call with questions, they know (and you know) you are getting the best answers. It’s Motorola’s research and development that benefits you, the customer. Through our work with Motorola Solutions, and with the desire to meet the needs and demands of our customers, we now have Canada’s largest selection of not only two way radios, but also two way radio accessories. The products we offer are backed by the knowledge of our staff and a value for your dollar. Having the right communications tools in place enables better efficiency in the workplace, higher levels of safety and, ultimately, better productivity. Want to learn more about the partnership between Nova Communications and Motorola Solutions and how it will benefit your business? We’d love to help you find a product that will work for you, and with a staff that spans more than 200 years in the two way radio business, we’ve worked with companies big and small to do just that. 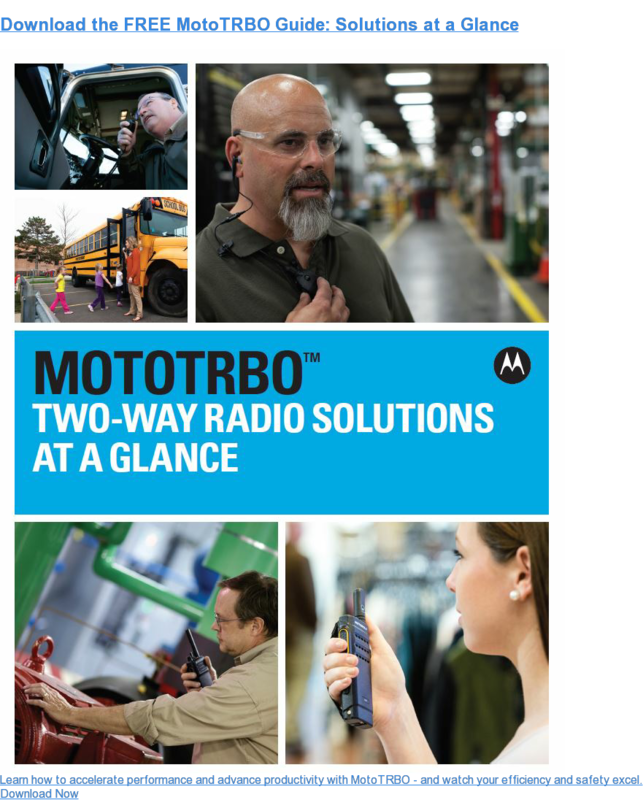 Contact us today or download the MotoTRBO Guide below to see what Motorola Solutions, and Nova Communications, can do for you.